The pilot project, an attempt to make downtown deliveries more efficient, will start in the Pike Place Market neighborhood and, if successful, could expand around Seattle and the nation. Curb space is at a premium in Seattle. With the rise of e-commerce deliveries, on-demand food services and ride-hailing apps Uber and Lyft, more vehicles are competing for limited parking spots and loading zones. In an attempt to get around this problem — and growing traffic congestion — United Parcel Service has unveiled a new delivery method that uses electric-assisted tricycles to make deliveries in the Pike Place Market area on a one-year trial basis. The cargo trikes, which feature trailers with detachable containers, can hold up to 400 pounds and have 95 cubic feet of space. Riders can reach speeds up to 20 mph, as permitted by state law. Employing people to make deliveries via bicycle isn’t new. As early as the 1870s, couriers were used in France to transport stock-market documents. In Seattle, Amazon experimented with bike messengers through a contractor for its one- to two-hour delivery service Amazon Prime Now, but discontinued it in 2016. Some food-delivery services, such as Caviar and Postmates, also employ bicycle couriers. UPS, under a former name, used motorized bikes as early as 1911. The electric-assisted trikes are a return to its roots, of sorts. Scott Phillippi, a senior project manager with UPS, said the trikes can maneuver in tighter spaces more easily. Truck drivers, meanwhile, must search for large enough parking spaces where their trucks can sit while deliveries are made. While finding curb space causes delays, delivery services are also slowed by other issues, such as clearing building security, riding freight elevators and locating a tenant’s door. UPS and the University of Washington’s Urban Freight Lab will evaluate the project on whether it reduces the number of times a package does not reach a customer on the first try, and how long the bikes are stationary — also known as dwell time. The Urban Freight Lab at the UW’s Supply Chain Transportation Logistics Center will also compare the trikes and trucks on measures such as miles traveled, carbon-dioxide emissions, use of parking space and how often stops are made, said Anne Goodchild, the director of the center and a professor of civil and environmental engineering. Researchers will suggest adjustments if the delivery system clogs bike-lane flow. “We have to look at how things work now and how they will be different with this bike,” she said. Trucks would still be needed for oversize and heavy packages, Phillippi said. UPS has used e-bikes for deliveries in Portland and Pittsburgh, but Seattle is the first city to pilot a system where boxes are loaded at the distribution center and towed to a delivery area. The company that became UPS was originally founded as American Messenger Company in Seattle in 1907. The global logistics firm is now headquartered in an Atlanta suburb. It was only fitting, Phillippi said, given UPS’ history in Seattle and the region’s interest in finding solutions to traffic congestion, to launch the pilot project in Seattle. 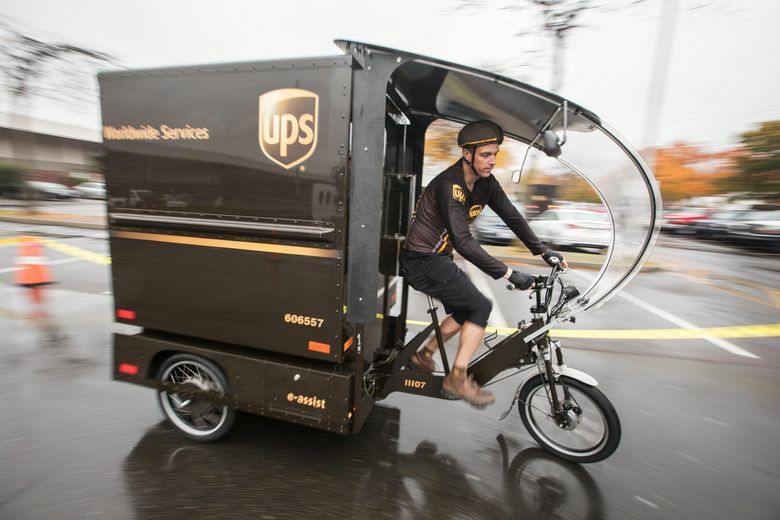 If it’s successful, UPS would expand the tricycle delivery service to other parts of Seattle and in other cities nationwide. “We see this as a great first iteration of something we’ve never done before,” he said.